IMAX Corporation and Warner Bros. Pictures, a division of Time Warner Inc., today announced that Gravity has passed the $100 million global box office benchmark in 639 IMAX 3D theatres worldwide since its initial release Thursday, Oct. 3, 2013. As of Feb. 5, 2014, the film had reached $48.6 million in 330 IMAX 3D theatres domestically and $51.5 million from 309 theatres internationally. 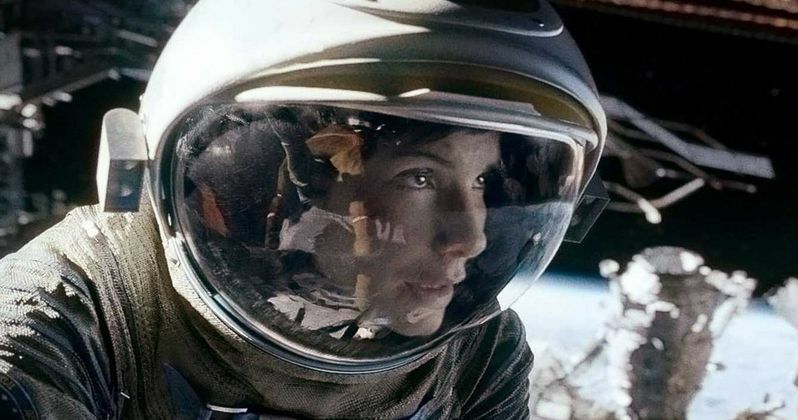 Gravity represents the third IMAX Hollywood film to cross the $100-million threshold, following Avatar in 2010 and The Dark Knight Rises in 2012. Gravity continues to pull moviegoers in to IMAX theatres, with a Jan. 31, 2014, re-release into 330 IMAX 3D locations in North America and other international territories. Filmmaker Alfonso Cuarón's internationally lauded drama, which stars Sandra Bullock and George Clooney, has been a hit with audiences and critics alike, closing in on the $700 million mark at the global box office, while receiving 10 Academy Award nominations, including Best Picture. Demand for the film -- which was also nominated for four Golden Globes, with Cuarón winning Best Director -- has been particularly high in IMAX 3D. Opening Oct. 4, Gravity was the highest-grossing IMAX release of 2013, both domestically and globally. Related: BOX OFFICE PREDICTIONS: Can Bad Grandpa Finally Beat Gravity This Weekend? Here's what IMAX CEO Greg Foster had to say in a statement about the box office milestone. "We congratulate our longtime partners at Warner Bros., along with writer-director-producer Alfonso Cuarón, and producer David Heyman, for crafting a visually and emotionally stunning film that appeals to IMAX audiences around the world and has also garnered widespread acclaim. We continue to be thrilled by the strong, enduring appeal of Gravity and look forward to even more moviegoers discovering this spectacular film in IMAX 3D over the coming weeks." The IMAX release of Gravity has been digitally re-mastered into the image and sound quality of The IMAX 3D Experience with proprietary IMAX DMR (Digital Re-mastering) technology. The crystal-clear images coupled with IMAX's customized theatre geometry and powerful digital audio create a unique environment that make audiences feel as if they are in the movie.